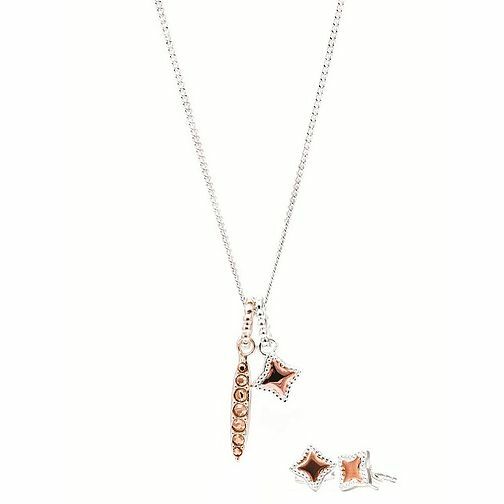 Styled in chic sterling silver with rich rose tone detail, this feminine pendant and stud earrings duo is perfect for everyday contemporary elegance. Discover all the ways to express yourself with one of a kind jewellery that reflects your life and experience. Inspired by your personal sense of style, Chamilia jewellery is as unique as you are. Chamilia Sterling Silver & Rose Gold Stud Earrings & Pendant is rated 3.5 out of 5 by 2. Rated 5 out of 5 by Anonymous from Chamillia gift set. Beautiful gift set. And a great price. Chamillia is always appreciated.